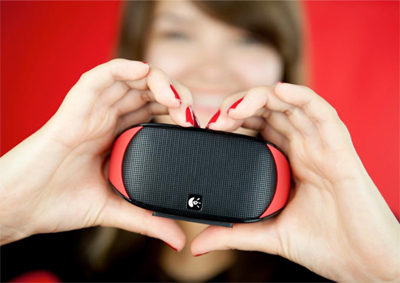 Logitech® Mini Boombox. Whatever you do with your smartphone or tablet, wherever you do it, do it out loud. This speaker pairs easily with smartphones, tablets or other Bluetooth®-enabled devices. Place it wherever you want within 33 feet (10 meters)* of your mobile device. Review: It's small but it's mighty! The Logitech Mini Boombox is a fantastic addition to any house or patio. Sync with your iphone or ipad and enjoy music where ever you need it. Have conversations with friends while cooking dinner, using the Speakerphone option.Entertaining is that much easier, using the Logitech Mini Boombox , with a great range of over 16 metres, entertainment becomes portable and flexible to any part of the house or backyard. With a maximum bench space of 10cm, the Logitech Mini Boombox suites small spaces that enjoy big volume. It's so copmpact you can take it on Camping trips and holidays!